You’ve seen these ledges all over the internet. They are perfect for that special collection of Photos and Mementos. It is so easy to make! I will show you 2 ways to do it! The first way is to use 1″ x 2″ wood pieces. 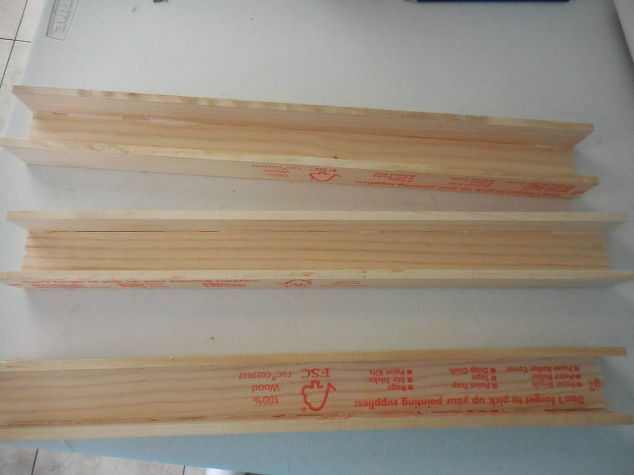 Cut 3 pieces, stain, glue together, then staple when dry. Looking at these I realized I had seen them before…hmm. What if you could do this for free. It’s the same principal I used on my ‘Paint Storage Using Paint sticks’. That’s right, paint sticks. You can pick some up in the paint department for free. You can hang them up with a couple of screws either way. This is what I did with them when finished, but you could easily flip them around like the stained one. The space between the paint sticks is exactly the size of the bottles. They fit in there snug. I have had this up for almost a year now….works perfectly, with no problems!!! Next Kids Can Do What With Shaving Cream??? If you had a store in my country where you’d sell all your home made stuff, I would buy tons! I do that already…I have learned to just teach them how to change the item themselves. i made several of these a few years ago to put in different rooms of the house, love them. great tutorial!